In fiber optic communication systems, problems arise from the fact that no fiber material is perfectly transparent. The visible-light or infrared beams carried by a fiber are attenuated as they travel through the material. This necessitates the use of optical amplifiers. And EDFA (Erbium Doped Fiber Amplifier) is a representative one in the optical amplifier. There is one saying that EDFA is the most popular optical amplifier in optical network communications. Next, we will begin with the definition of EDFA. 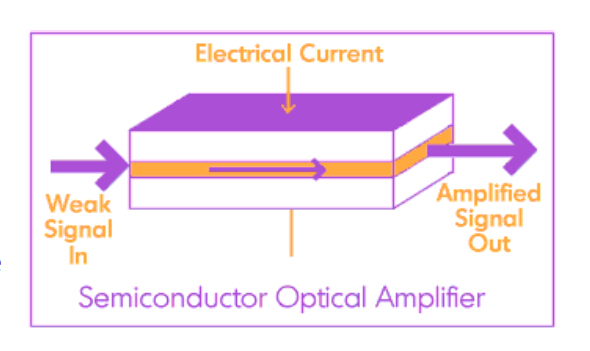 An EDFA, also called optical amplifier or an erbium-doped fiber amplifier or erbium amplifier, is an optical or IR (Infrared Radiation) repeater that amplifies a modulated laser beam directly, without opto-electronic and electro-optical conversion. The device uses a short length of optical fiber doped with the rare-earth element erbium. When the signal-carrying laser beams pass through this fiber, external energy is applied, usually at IR wavelengths. This so-called pumping excites the atoms in the erbium-doped section of optical fiber, increasing the intensity of the laser beams passing through. The beams emerging from the EDFA retain all of their original modulation characteristics, but are brighter than the input beams. Booster amplifiers are placed directly after the optical transmitter. In this application, booster amplifier is adopted to compensate for the losses of optical elements between the laser and optical fibers so that the increased transmitter power can be used to go further in the link. In-line amplifiers or in-line repeaters are placed along the transmission link to compensate for the losses incurred during propagation of optical signal. They take a small input signal and boost it for re-transmission down the fiber. Here it should also be pointed out that to control the signal performance and the noise added by the EDFA is important, because noise added by amplifier will limit the system length. Pre-amplifiers are placed just before the receiver to increase the signal level before the photodetection takes place in an ultra-long haul system so as to improve receiver sensitivity. By placing a pre-amplifier, a much larger signal can be presented to the receiver, thus easing the demands of the receiver design. By now, you should have a basic idea of what an EDFA is and what it is used for, next I will introduce you some truly excellent EDFA products on the market. Of the various technologies available for optical amplifiers, EDFA technology is the most advanced, and consequently the vast majority of optical amplifiers are designed based on this technology. In addition, the combination of reliable performance and relatively low cost allows EDFA to be widely deployed in modern optical networks. This entry was posted in WDM Optical Network and tagged EDFA, Optical Amplifier on June 29, 2017 by Admin. Transmission distance has always been a key factor during deployment of fiber optic network. DWDM technologies, which are considered as the most cost-effective ways to increase the network capacity over long transmission distance, have been widely applied in our telecommunication network. To further extend transmission distance of optical signals transmission from the DWDM fiber optic transceivers, optical amplifiers are usually used in the DWDM network. Different types of optical amplifiers have been invented to meet the signal amplifying requirements at different situations. This post will introduce the differences between the three most commonly used optical amplifier: pre-amplifier, booster amplifier and in-line amplifier. In the past, if you want to extend the transmission distance of DWDM network, optical regenerator station is required to be installed in the fiber link every 80km to 100km. The regenerator station will electronically regenerate the optical signals to overcome the power loss and ensure that the optical signal can be detected at the receiver end. However, this requires a lot of money and is not easy to upgrade the whole network. With optical amplifier, things become much easier. The optical amplifier can enlarge the optical signals without the regeneration. In addition, the network upgrading is more cost-effective with optical amplifier. Each optical amplifier has an important factor which is operation gain measured in dB. The operation gain of the optical amplifier should be carefully calculated to ensure the network performance. Pre-amplifier, booster amplifier and in-line amplifier are used in different places in the fiber optic network. And they support different operation gain according to the whole network requirement. 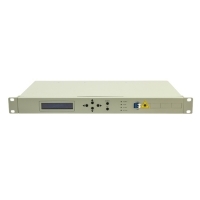 Pre-Amplifier is usually installed at the receiver end of the DWDM network to amplify the optical signal to the required level to ensure that it can be detected by the receiver. The following picture shows a typical diagram for a duplex 10G DWDM network which can support 80km. A pre-amplifier is installed at each receiving end of this network. There will be great power loss after the optical signal goes through the 80km optical fiber. Then, pre-amplifier installed at the receiver end is necessary. Generally, a pre-amplifier should offer high gain to ensure that the optical signal is detectable. Booster Amplifier is installed in the transmitting end of the fiber optic network, which can amplifier the amplify the optical signal launched into the fiber link. It is usually used in DWDM network where the multiplexer attenuates the signal channels. The following picture shows a 10G DWDM network using booster amplifier (BA) at the transmitting end and pre-amplifier (PA) at receiving end. Thus, this 10G DWDM network can support a transmission distance much longer than the above mentioned one. Please note, a DCM (Dispersion Compensation Module) is added in this network to further ensure the transmission quality. A booster amplifier usually provides low gain and high output power. In-line Amplifier is easy to understand. The gain provided by the pre-amplifier and booster amplifier might not be enough due to the optical loss caused by long haul transmission. In-line amplifier is installed in the fiber optic link every 80-100km as shown in the following picture. It has moderate gain and has similar output power to those of booster amplifier. Optical amplifier can help to amplifier the optical power during long haul transmission to ensure that the receiver can detect the optical signal without error. Three amplifiers are commonly used in DWDM network. Booster amplifier is used to amplifier optical power at the transmitting end and pre-amplifier is placed at the receiver end. If the transmission distance is longer than 150km or have great power loss during transmission, in-line amplifier is suggested to be installed every 80km to 100k in the fiber optic link. The gain of these amplifiers should be carefully calculated during practical use. Kindly visit DWDM EDFA Amplifier page for more details. This entry was posted in EDFA Amplifier, Network Solutions, Optical Amplifier, WDM Optical Network and tagged booster amplifier, in-line amplifier, Optical Amplifier, pre-amplifier on January 4, 2017 by Alice Gui. How to Extend Transmission Distance in DWDM Network? 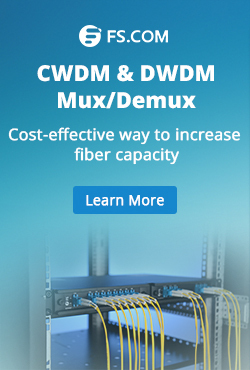 DWDM network has been widely accepted as the most cost-effective and feasible solution to increase the fiber optic network capacity over long distance. Except the bandwidth, the transmission distance is also an important factor during the deployment of DWDM network. This post is to introduce how to ensure and extend the transmission distance in DWDM network. Generally, the fiber optic transmission distance is affected by the data rate, light loss, light source, etc. During the deployment, technicians usually need to select proper fiber optic transceivers to ensure the light source is strong enough to support the long transmission distances. For instance, 1G DWDM SFP modules provided by the market can usually support transmission distance up to 100km, while for 10G DWDM SFP+ modules this distance decrease to 80km. If the longer transmission distance is to achieve, proper fiber optic devices should be added in the DWDM network to ensure the transmission quality. 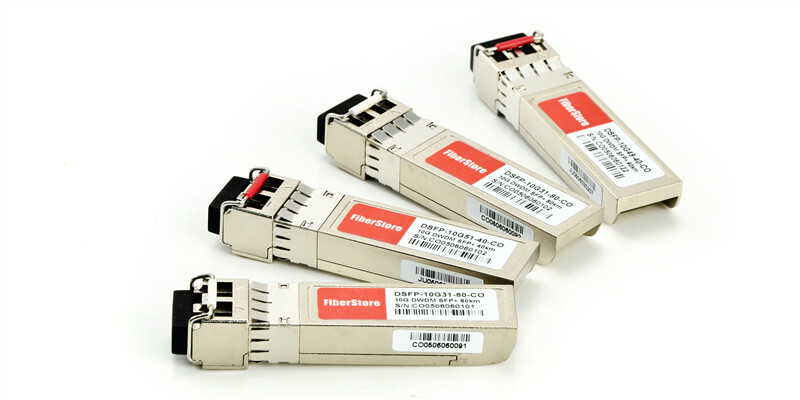 The following part will take the examples of 10G DWDM network which uses DWDM SFP+ modules supporting transmission distance up to 80km on both ends of the fiber link. This 10G DWDM network will be required to support fiber optic links up to 40km, 80km, 120km and 200km separately. 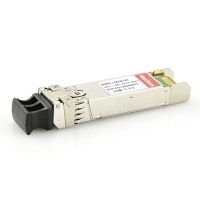 In this first case, this 10G DWDM network is required to support 40km transmission distance. As we are using the 80km DWDM SFP+ modules, if there are no other locations deployed between the two ends of this network, generally no other devices are required to be installed between the two DWDM MUX/DEMUXs. The light source of 80km DWDM SFP+ modules can support 10G transmission over 40km. If this DWDM network is required to support 80km transmission distance, we will still use the 80km DWDM SFP+ modules. 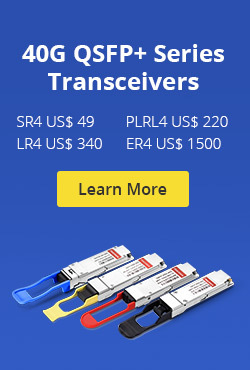 The light source of these 80km DWDM SFP+ modules might not be able to support such long transmission distance, as their might have light loss during transmission. In this case, pre-amplifier (PA) is usually deployed before the receiver to improve the receiver sensitivity and extend signal transmission distance. Meanwhile, the dispersion compensation module (DCM) can be added in this link to handle the accumulated chromatic dispersion without dropping and regenerating the wavelengths on the link. The following diagram shows the deploying method of this 80km DWDM network. It is known that the light power will decrease with the increasing of transmission distance. More fiber optic devices should be added in the 120km DWDM network to amplify the optical signal transmission from the 80km DWDM SFP+ modules. The following diagram shows how to deploy this 120km DWDM network. Except the above mentioned pre-amplifier and dispersion compensation module, a booster EDFA (BA) is suggested to deploy before at the beginning of the transmitting side to further ensure optical signal can achieve 120km. The above cases just simply illustrate the deployment of 40km, 80km and 120km 10G DWDM network that uses 80km DWDM SFP+ modules as light source. Related products in the above mentioned cases are listed in the following table. Please note that during the deployment of these long haul DWDM network, the light loss and compensation dispersion should be well calculated. In fact, DWDM technologies and products can achieve transmission distance much longer than 120km, like 170km DWDM and 200km DWDM. If you are interested, kindly visit our Long Haul DWDM Network page where you can find specific details for complete DWDM network deployment solutions. This entry was posted in How To, Network Solutions, WDM Optical Network and tagged 80km DWDM SFP+, extend dwdm network, long haul DWDM, Optical Amplifier on December 30, 2016 by Alice Gui. With the rapid development of the optic communication networks, longer transmission lengths are required. Optical amplifier can satisfy the requirements of optical communication networks. An optical amplifier is a device that amplifies an optical signal directly, without the need to first convert it to an electrical signal. An optical amplifier may be considered as a laser without an optical cavity, or one in which feedback from the cavity is suppressed. This post is going to help you get a better understanding of optical amplifier. A basic optical communication link contains a transmitter and receiver, with an optical fiber cable connecting them. Although signals transmitting in optical fiber suffer far less attenuation than in other mediums, such as copper, there is still a limitation about 100 km on the distance the signals can travel before becoming too noisy to be detected. Optical amplifiers are widely used in fiber optic data links. Figure 1 shows three ways in which optical amplifiers can be used to strengthen the performance of optical data links. A booster amplifier is used to increase the optical output of an optical transmitter just before the signal enters an optical fiber. The optical signal is attenuated as it travels in the optical fiber. An inline amplifier is utilized to restore (regenerate) the optical signal to its original power level. An optical pre-amplifier is operated at the end of the optical fiber link in order to increase the sensitivity of an optical receiver. There are three most commonly used types of optical amplifiers, as shown from left to right: erbium-doped fiber amplifier, the semiconductor optical amplifier, and the fiber Raman amplifier. The amplifying medium is a glass optical fiber doped with erbium ions. The erbium is pumped to a state of population inversion with a separate optical input. The erbium-doped glass optical gain medium amplifies light at wavelengths that are in the neighborhood of 1550nm – the optical wavelengths that suffer minimum attenuation in optical fibers. The erbium-doped fiber amplifier (EDFA) is the most deployed fiber amplifier. 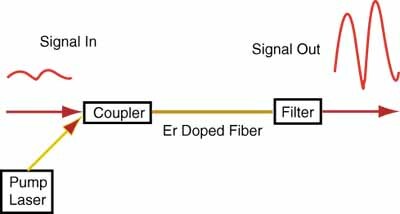 Erbium-doped optical fiber amplifiers (EDFAs) have low noise and can amplify many wavelengths simultaneously, making the EDFA the amplifier of choice for most applications in optical communications. The gain medium is undoped InGaAsP. This material can be tailored to provide optical amplification at wavelengths near 1.3 µm or near 1.5 µm – important wavelengths for optical communications. Other semiconductors can be used to amplify optical signals at other wavelengths. The input and output faces of the amplifier are antireflection coated in order to prevent optical feedback to the gain medium and lasing. Semiconductor Optical Amplifier with its features of small package, low-cost applications and potential use for optical switching, it can be a great choice to suit most customers. In a Raman amplifier, the signal is intensified by Raman amplification. Unlike the EDFA and SOA the amplification effect is obtained by a nonlinear interaction between the signal and a pump laser within an optical fiber. There are two types of Raman amplifier: distributed and lumped. 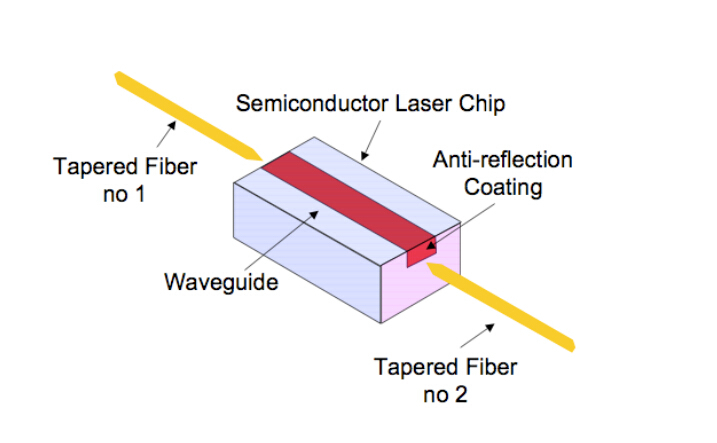 A distributed Raman amplifier is one in which the transmission fiber is utilized as the gain medium by multiplexing a pump wavelength with signal wavelength, while a lumped Raman amplifier utilizes a dedicated, shorter length of fiber to provide amplification. Optical amplifier plays a very important role in modern optical networks, enabling the transmission of many terabits of data over long distances of up to thousands of kilometers. 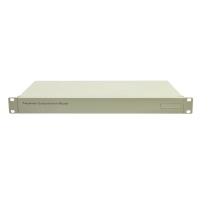 Optical amplifiers provided by Fiberstore are designed for all network segments and applications. For more information please visit fs.com. This entry was posted in Optical Amplifier and tagged Optical Amplifier, Semiconductor optical amplifier, Types of Optical Amplifier on May 25, 2015 by Admin. Optical amplifier is an important technology for optical communication networks. Without the need to first convert it to an electrical signal, the optical amplifiers are now used instead of repeaters. As we know, there are several types of optical amplifiers. Among them, the main amplifier technologies are Doped fiber amplifier (eg. EDFA), Semiconductor optical amplifier (SOA) and Fiber Raman amplifier. Today, we are going to study and compare different types of optical amplifiers in this paper. OK, after a brief introduction of the optical amplifiers, we formally begin today’s main topic. As we talk above, there are three main types of today’s amplifier technology. Each of them has their own working principle, features and applications. We will describe them one by one in the following paragraphs. Erbium-doped fiber amplifier (EDFA) is the most widely used fiber-optic amplifiers, mainly made of Erbium-doped fiber (EDF), pump light source, optical couplers, optical isolators, optical filters and other components. Among them, a trace impurity in the form of a trivalent erbium ion is inserted into the optical fiber’s silica core to alter its optical properties and permit signal amplification. The working principle of the EDFA is to use the pump light sources, which most often has a wavelength around 980 nm and sometimes around 1450 nm, excites the erbium ions (Er3+) into the 4I13/2 state (in the case of 980-nm pumping via 4I11/2), from where they can amplify light in the 1.5-μm wavelength region via stimulated emission back to the ground-state manifold 4I15/2. Semiconductor optical amplifier is one type of optical amplifier which use a semiconductor to provide the gain medium. They have a similar structure to Fabry–Perot laser diodes but with anti-reflection design elements at the end faces. Unlike other optical amplifiers SOAs are pumped electronically (i.e. directly via an applied current), and a separate pump laser is not required. 1.Stimulated emission to amplify an optical signal. 2.Active region of the semiconductor. 3.Injection current to pump electrons at the conduction band. 4.The input signal stimulates the transition of electrons down to the valence band to acquire an amplification. The semiconductor optical amplifier is of small size and electrically pumped. It can be potentially less expensive than the EDFA and can be integrated with semiconductor lasers, modulators, etc. All four types of nonlinear operations (cross gain modulation, cross phase modulation, wavelength conversion and four wave mixing) can beconducted. SOA can be run with a low power laser. This originates from the short nanosecond or less upper state lifetime, so that the gain reacts rapidly tochanges of pump or signal power and the changes of gain also cause phase changes which can distort the signals. The performance of SOA is still not comparable with the EDFA. The SOA has higher noise, lower gain, moderate polarization dependence and high nonlinearity with fast transient time. 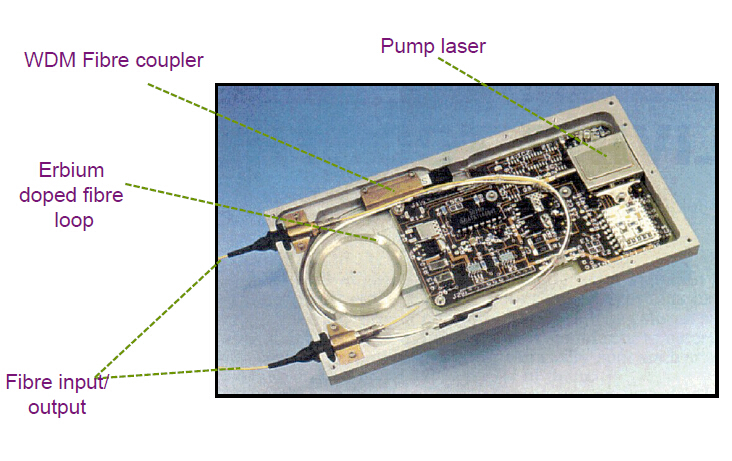 Fiber Raman Amplifier (FRA) is also a relatively mature optical amplifier. In a FRA, the optical signal is amplified due to stimulated Raman scattering (SRS). In general, FRA can is divided into lumped type called LRA and distributed type called DRA. The fiber gain media of the former is generally within 10 km. In addition, it requires on higher pump power, generally in a few to a dozen watts that can produce 40 dB or even over gains. It is mainly used to amplify the optical signal band of which EDFA cannot satisfy. The fiber gain media of DRA is usually longer than LRA, generally for dozens of kilometers while pump source power is down to hundreds of megawatts. 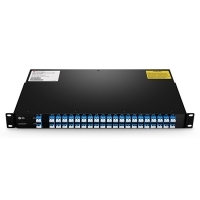 It is mainly used in DWDM communication system, auxiliarying EDFA to improve the performance of the system, inhibiting nonlinear effect, reducing the incidence of signal power, improving the signal to noise ratio and amplifing online. The principle of FRA is based on the Stimulated Raman Scattering (SRS) effect. The gain medium is undoped optical fiber. Power is transferred to the optical signal by a nonlinear optical process known as the Raman effect. An incident photon excites an electron to the virtual state and the stimulated emission occurs when the electron de-excites down to the vibrational state of glass molecule. The Stokes shift corresponding to the eigen-energy of a phonon is approximately 13.2 THz for all optical fibers. 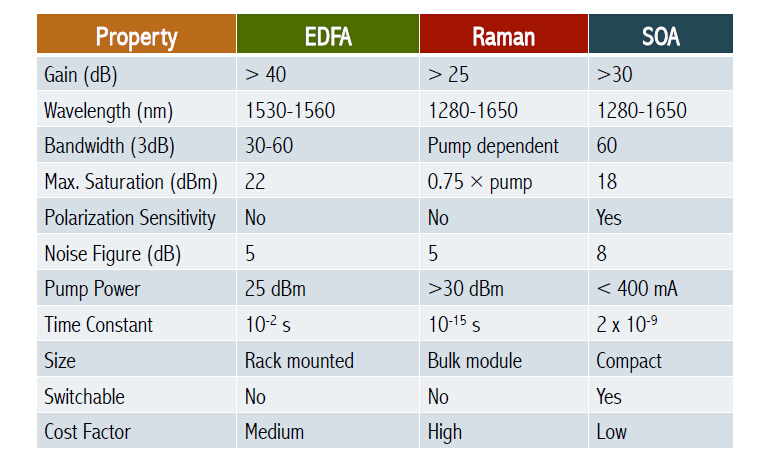 After talking about these three types of optical amplifiers, we make a comparison of them as the following table. This entry was posted in EDFA Amplifier, Optical Amplifier and tagged EDFA, fiber optic amplifier, Optical Amplifier, Raman amplifier, Semiconductor optical amplifier, Types of Optical Amplifiers on December 16, 2014 by Admin.